The Urban Centre built in 1981. 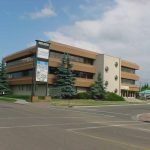 It is a 26,934 square foot three storey commercial office building well located within this thriving City offering elevator service and 70 surface and 22 underground parking stalls. The building is well suited for office and medical users. Owned By: Urban Centre Investments Ltd.